We are reaching the end of Oracle Open World. 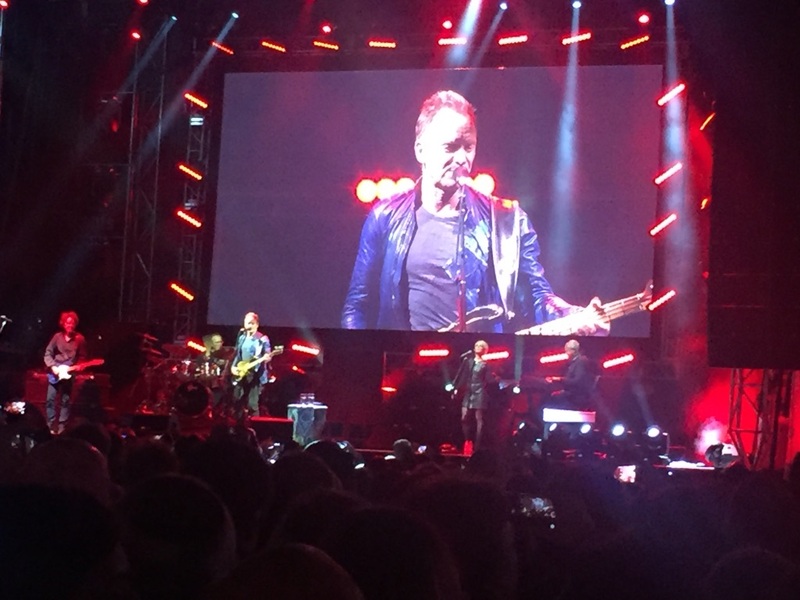 Wednesday ended with the Appreciation Event which included the star appearances of Gwen Stefani and Sting. Both were really appreciated by the public, but I personally found Sting's performance just fantastic. Anyway, let's live music behind before it clearly shows I don't have a clue about it. Wednesday was also a very intense day around PeopleSoft. I was able to attend very valuable sessions around different aspects of Fluid User Interface and ElasticSearch. 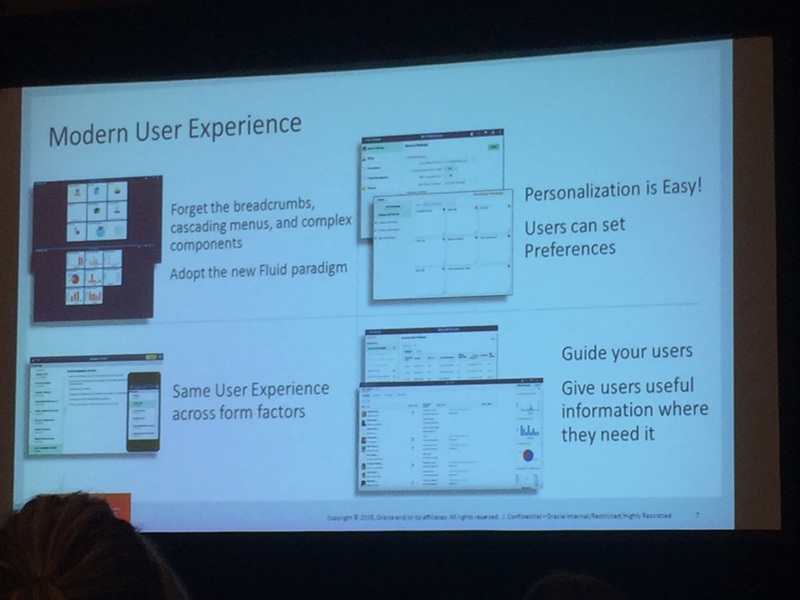 Getting the Most Out of PeopleSoft: PeopleSoft Fluid User Interface [CON7067] by Matthew Haavisto, Pramod Agrawal and Sasank Venama. Discover What Is New in PeopleSoft Approvals: PeopleSoft Fluid User Interface, Page Composer [CON7065] by David Bain, from PeopleTools Product Management. Hands-On with PeopleSoft: A Successful PeopleSoft Fluid User Interface Rollout [CON7063] delivered by David Bain, Kevin De Kock from McMaster University, Graham Smith and Sasank Venama. Extending PeopleSoft Fluid User Interface Applications the PeopleSoft Way [CON7062] by David Bain. 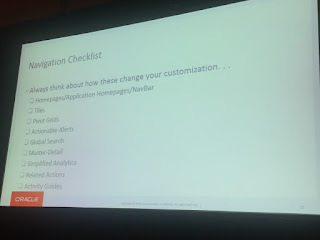 My take from these sessions is that the key for being successful at deploying Fluid is not only taking advantage of nice UI features that Fluid provides, but mainly profiting from the new navigation approach proposed by PeopleTools 8.55. Now, as simple as navigation may seem at first, it really requires to put some thought when it comes to Fluid. In the classic UI, we were kind of guided by the system to put our components into the portal menu structure and that was pretty much it. When using Fluid UI, we have several alternatives, and the optimal use is not always evident. These sessions helped better understand when each option is best applicable. 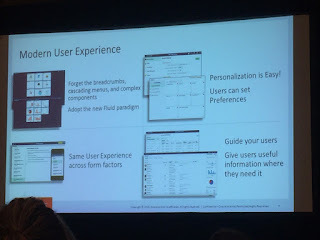 You can also check the PeopleSoft Fluid UX Standards page for more information. In terms of new announcements, not much was presented. 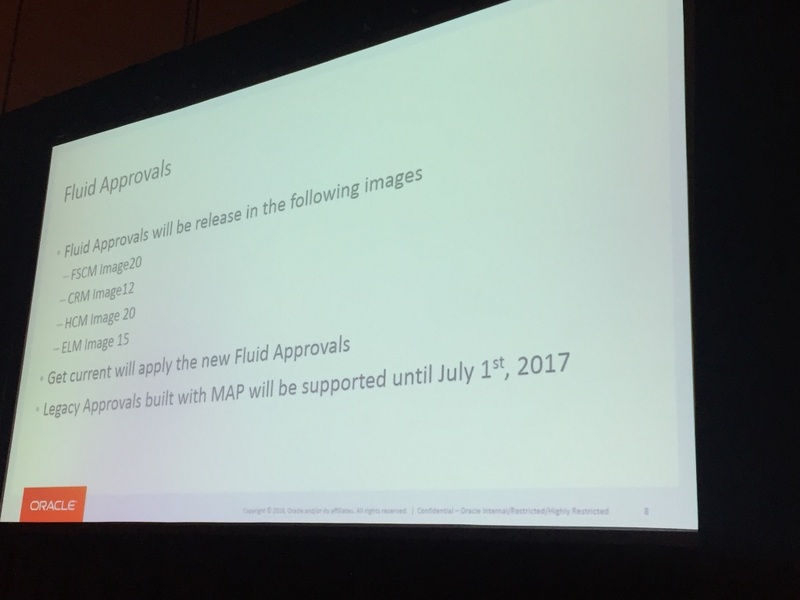 Probably the key announcement on Fluid UI is the new Page Composer for Mobile Approvals that is now available with PeopleSoft FSCM Update Image #20 and will soon be available for the other pillars. I've briefly covered it during my Tuesday's review post, but in a nutshell Page Composer will allow to configure the display of Mobile Approval pages by transaction and form factor. All this done in a nice drag & drop web based interface. Could this be extended to other functionalities apart from Mobile Approvals? Not yet, Oracle says, but they are not discarding that either in the future. From my point of view, I have certain concerns at performance, because the HTML is not produced by the Application Server binary code, but PeopleCode itself. However, this was already the case for MAP-based Mobile Approvals, so I can only see the upside for it. Whether it can be extended or not to other functionalities, we will see. 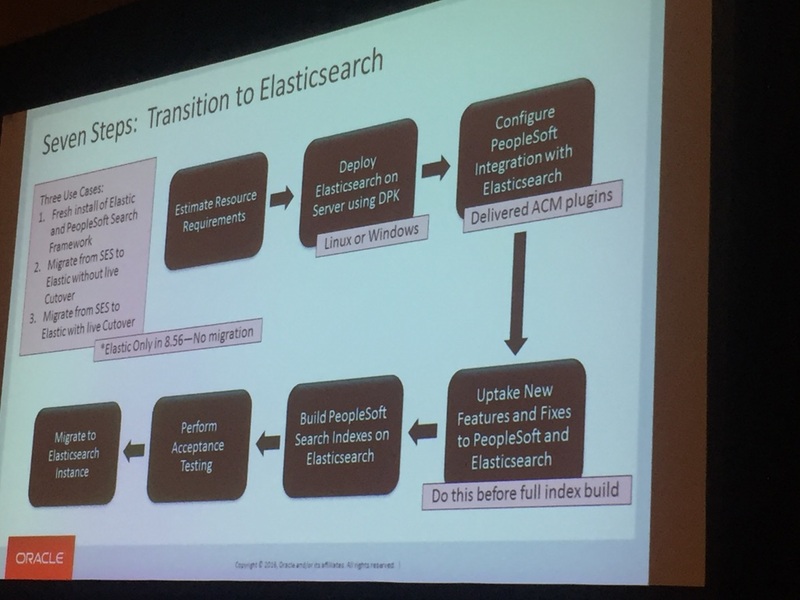 ElasticSearch has been longly awaited in the PeopleSoft community, mainly because it will replace Oracle SES, which was personally one of the most-hated components of PeopleSoft, if anything like love & hate makes sense when talking about technology (nerd alert here!). There was a very interesting session, Getting the Most Out of PeopleSoft: Transitioning to Elasticsearch [CON7066], delivered by Mathew Haavisto, Ramasimha Rangaraju from Oracle and Kevin Antoff from Wells Fargo. In this session, Oracle and Wells Fargo presented the Proof of Concept they did together around ElasticSearch as replacement to Oracle SES. The feedback provided by Wells Fargo was extremely positive, almost from any perspective. Also the transition to ElasticSearch seems simple. 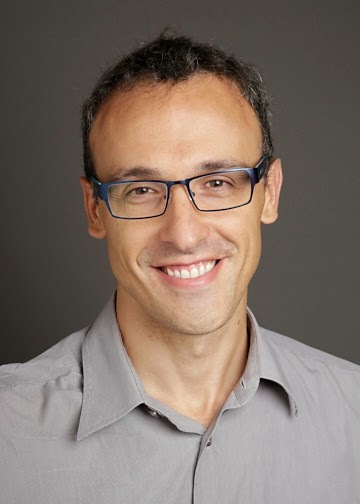 Both solutions can actually coexist, meaning that you can install and deploy ElasticSearch while Oracle SES is still operational, providing the opportunity of zero-downtime. Still, we need to make sure we adopt ElasticSearch quickly. Support for Oracle SES will end 18 months after the ElasticSearch solution is made generally available. When will that happen? The almighty Safe Harbor Statement does not allow us to know the precise date, but I got the feeling that it is not going to be far from now (it will be delivered as part of PeopleTools 8.56 but will also be enabled for a future patch of PeopleTools 8.55). I cannot wait to play around with it. I would be particularly interested in using cloud services of ElasticSearch together with PeopleSoft, so we don't need to use our own infrastructure. We will see if that is feasible when it is finally delivered. Today will be the last day at Oracle Open World. I will try to post my last review of Oracle Open World at the end of the day, but if I can't, it will be for sure during the week-end when I'm back in Spain. If you are here at Oracle Open World, please say hello. It doesn't get better than this where it comes to networking opportunities. I agree with you using cloud services of ElasticSearch together with PeopleSoft, if possible, would be fantastic. We need to deliver faster and faster so the Cloud would make sens in that case. Dear man, Do we use peoplecode if Peolesoft move to Cloud? Well, PeopleSoft in the Cloud means that the application could be hosted in cloud infrastructure. However, you will still retain full access to development tools. In a way, it is similar to old hosting services, except the flexibility advantages you can find in cloud infrastructure if you need more horsepower at a certain point.